During the 1830's, both the Ottoman Empire, and the British Empire came into conflict over the southern end of the Arabian peninsula. The Ottomans wanted to create a pan-Arab empire, whilst the British controlled the city of Aden as a strategically valuable city on the route from the Suez canal to India. From 1918, the Ottomans where kicked out of North Yemen, to form the Mutawakkilite Kingdom of Yemen. 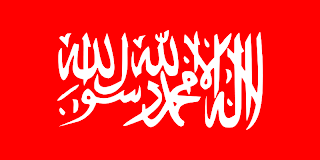 The first banner was a simple plain red flag. In 1923, they added the Shaddahah to the flag, in white. Then, in 1927, the flag was updated once more. 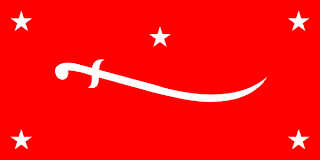 This time, placing a white sword on red, with 5 stars round the sword. In 1962, following a wave of Arab nationalism, revolutionaries rose up, and overthrew the King, forming the Yemen Arab Republic. 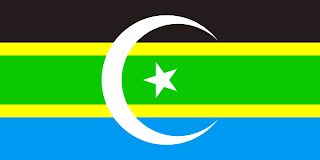 Their flag was inspired by the flag of Egypt. A horizontal tricolour of red, white, and black. In the centre, they placed a green, 5 pointed star. South Yemen fell under the control of the British, forming the Aden Protectorate. It proved valuable as the city of Aden could form a strategic coaling station for ships from Britain to India via the Suez canal. 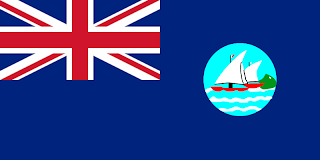 The Blue Ensign featured a circle in the fly, on which included Arabian style ships before mountains. In 1963, half the territories where united to form the federation of South Arabia. The new flag was a horizontal tricolour of black, green, and blue. The stripes where separated by thin lines of yellow. In the centre, a large white crescent and star emblem. The rest of the territories united to form the Protectorate of South Arabia. in 1967, the British withdrew, and the National Front rose to power in the new Peoples Republic of South Yemen. 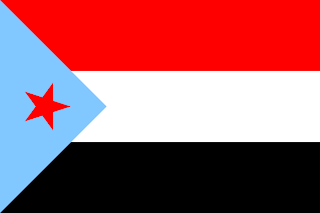 Then, in 1969, a radical wing of the National Front rose to power, and changed the name of the nation to the People's Democratic Republic of South Yemen.The flag also took the same tricolour as North Yemen, of red, white, and black. However, they added a light blue triangle to the hoist of the flag, and placed a red star of communism on the triangle. Unlike East and West Germany, and North and South Korea, relations between North and South Yemen, whilst sometimes strained, where generally cordial. 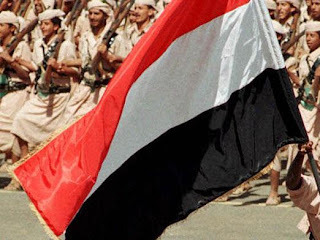 And finally, in 1990, the two Yemen's where reunified. They took both Yemeni flags, and adopted the simple tricolour of red, white, and black, and losing the adornments of both previous flags. The colours are stated to represent the blood of the martyrs (red), white stands for a bright future, and black stands for the dark history of Yemen.